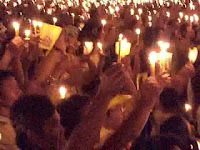 Perhaps never again in its history will Thailand be so united around a single figure as it was on Wednesday. The occasion marked the eightieth Birthday of His Majesty King Bhumibol, Rama IX of the Chakri Dynasty. He is the world's longest serving head of state, and the longest-serving monarch in this nation's history. I stood on the grounds of the Bangkok's Royal Palace yesterday not so much to get a glimpse of Thai royalty, as to observe the Thai people. I wanted to experience firsthand a social phenomenon on a scale which can only be witnessed a few times in a given century anywhere in the world: a wildly popular monarchy at its height. 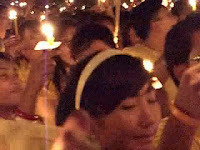 Such a heartfelt spectacle may never again be seen in Asia, at least in our lifetimes. To give you a feeling for it -- and what I'm really attempting to document here is an emotion -- I submerged myself in a human sea of yellow shirts and took this video. 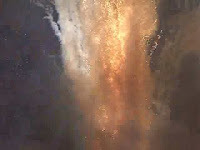 I have seen dozens of fireworks displays in my life, but the the sudden explosions of light towards the end of the video represent the most awesome spectacle of fire I have ever witnessed. It was terrifying. This is not to downplay the singing of royal anthems which preceded it -- scenes which still give me the shivers. Elsewhere on this blog I have taken a more analytical approach to the Thai monarchy, but any interpretation of the institution is incomplete without appreciating the depth of feelings of the Thai People for their sovereign.